Sometimes you can find an author with a special talent for writing books to fall in love with. Everyone has their own preference when it comes to who they consider to be their master storyteller. I like to think of a personal library as being like a court where you can choose who you give preference to and where you can assign favourite status to those who please you most. In my court I have a couple of favourites, each chosen for different reasons. These preferences can change on a whim, just as a fickle king can love someones company one day and dismiss them from his sight the next, but generally a true favourite can maintain favour whether they are consistent or not. Sometimes it’s enough for an author to produce just two or more favourite stories for their favour to be cemented. My favourite author at the moment is Sarah Monette. I don’t know when exactly I decided Sarah Monette is my favourite author. There was no light bulb moment when it clicked into place. It was more of a slow dance that gently began to pick up the pace as I kept reading and reading, until I was knocked off my feet by a book of hers and we swirled around in circles in a way that I never wanted to end. The book that started my love of Sarah Monette’s books was The Goblin Emperor, written under the pen name Katherine Addison. Gentle Maia is a half-goblin and the exiled son of the elf Emperor. It takes everyone by surprise when Maia’s father and older brothers die in an airship crash leaving Maia the most immediate heir. As third in line to the throne he was never expected to succeed his father. He lacks experience and the court have preconceived negative ideas about his fitness to govern. Maia must quickly get to grips with the tricks, betrayals and negotiations that characterise court life. The atmosphere of the novel’s world is claustorophibic and complicated. I love this book to pieces. It won’t be everybody’s cup of tea but it ticked all of the boxes for me. I wanted to follow these character’s lives forever. I’ve reread it many times over the last few months. One of the keys to it’s success was probably the fact it managed to be the right book for me at the right time. I have a tendency to associate books with what was going on in my life when I first read them. I read this one when I was having a very difficult time at home and it was my escape. Now I associate the book with ideas of sanctuary. I recently went looking for more books by this author because surely the others must be just as magical, right? I found The Doctrine of Labyrinthsseries and was far from disappointed. I’m one book a way from finishing the series and I love it just as much as The Goblin Emperor, although for rather different reasons. 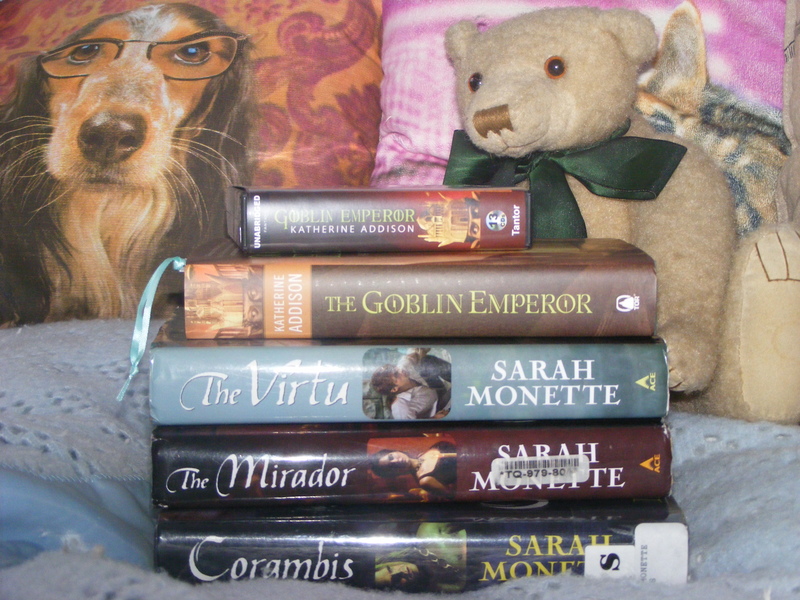 I associated The Goblin Emperor with sanctuary first but now I feel comfortable in expanding this association to the works of Sarah Monette in general. You can have many favourite authors during your reading life and favourites can be chosen for many different reasons. You could pick the author that always makes you laugh, the author that wrote the books that accompanied your childhood or that author that never fails to offer you a rich world to escape to when you need it most. Who are your favourite author(s)?